Meet Your Neighbor Albert (AJ) Brasel. A.J. is a part of the new staff at West Central. He is high school Biology teacher, assistant football coach, head boys track coach and freshman class sponsor. He was born in St. Louis, Missouri, and raised in Troy. 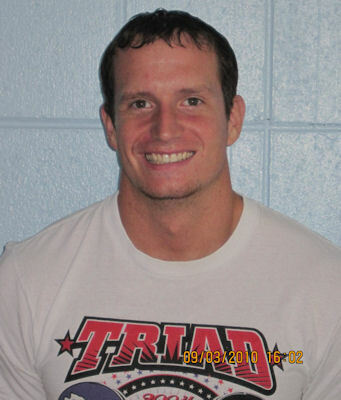 In 2005 he graduated from Triad High School. To further his education, in 2010, he received his BS in Biology with a minor in Chemistry from Eastern Illinois University in Charleston with teacher certification. His father, Jeff Brasel, owns a grocery store and lives in Edwardsville. His mother, Cynthia Null, fits comprehensive garments for mastectomy and burn patients. He has one brother, Tony (Tera) Brasel of Collinsville. Tony is currently in the Army and Tera is an English teacher. His sister, Amanda, is a student at Southeastern Jr. College in Belleville, and his 8 year old brother, Zachary, is a grade school student in Edwardsville. Six days a week he does weight training either at school or at the Burlington, Iowa, YMCA. A.J. runs 3 miles a day and in 2006 was a marathon runner in Chicago. He also enjoys fishing and sports. The Green Bay Packers is his favorite football team and the St. Louis Cardinals is his favorite major league baseball team. He really enjoys college football especially, the Big 10. When asked what he liked about West Central he said, "I like the atmosphere in the high school and being with young adults. I hope to be a roll model and leave a lasting positive impression to the students. I also enjoy being a part of the football program at West Central. I am truly excited to come to work each day!"